The three Central Peace-Notley candidates, Todd Loewen UCP, Marg McCuaig-Boyd NDP and Wayne Meyer Alberta Liberal Party, during the all candidates debate at G.P. Vanier. Three out of the four candidates running in the Central Peace-Notley riding attended an “All Candidates Forum” at G.P. Vanier School in Donnelly on April 2. Students, teachers and members of the community attended the debate, which was largely a reiteration of each candidates previously established platform. 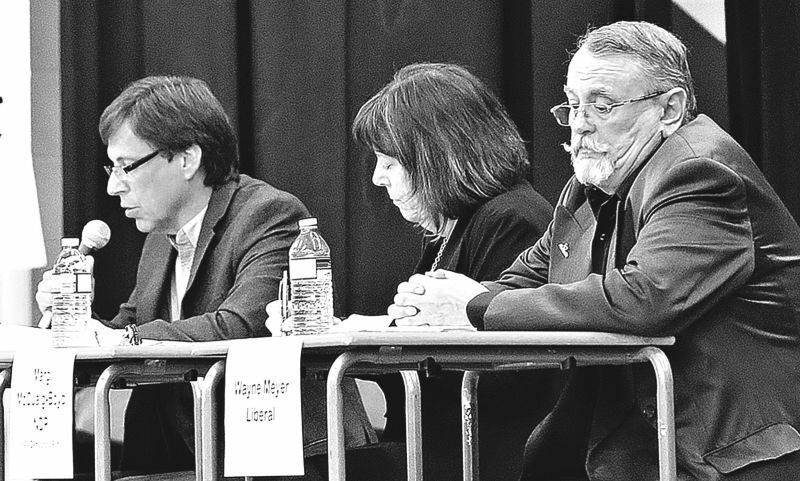 Predictably, the two incumbents and front- runners, NDP candidate Marg McCuaig-Boyd and UCP candidate Todd Loewen reserved their gibes for each other while ignoring the policies espoused by Liberal Party Candidate, Wayne Meyer. For those unaware of the positions that McCuaig-Boyd and Loewen each represent, the debate may have been informative, but for anyone familiar with the candidates the debate held no new revelations. However, Wayne Meyer was articulate and succinct in offering his perspective and plans on health care, education, the economy, and developing the province’s resource industries and pipeline expansion. What little wit or spontaneity that crept into the debate also was delivered by Meyer. The rigidly designed event gave each candidate an allotted time to impart his or her platform to the students and people from the community in attendance. While this format is created to prevent a candidate from monopolizing the debate or having the debate become too acrimonious, that concession to civility comes with the price of not allowing the audience to become familiar with the candidates or see how they can think on their feet. The pre-approved questions put to the candidates towards the end of the forum also appeared wooden, allowing them to revert to scripted sound bits rather than showing any naturalness or shedding any new light on the issues. Each candidate was allowed to deliver a short summation of their position at the conclusion of the debate and while they all expressed their commitment and affection for the Peace River region and its citizens, the candidates delivery seemed perfunctory lacking in any real passion. For those who are undecided about where to put their support on April 16, the G.P. Vanier forum would have done little to sway them in any particular direction.